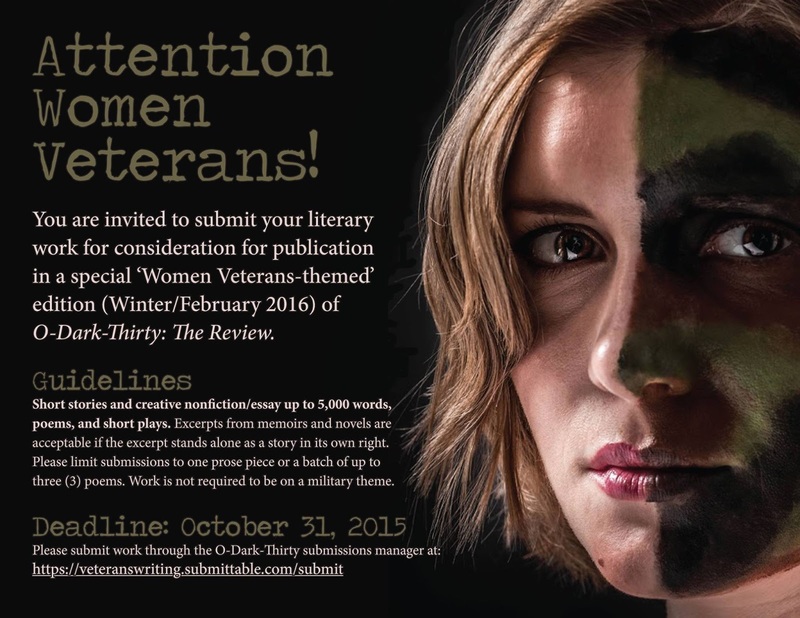 Editors of a special Spring 2016 women-veterans issue of the literary journal "O-Dark-Thirty" are nearing the end of their submissions window. Deadline is Oct. 31, 2015. "We’ve received four or five times the usual number of submissions for a quarterly issue, and the quality of the ones I've read so far has been high," she writes at "Presumption and Folly," her own military-themed blog. "We’re excited to be able to publish some of the work, and we expect that the themed issue will be longer than usual." "We're closing the window for submissions for the issue at midnight on October 31. This will give our editors time to read everything carefully before selecting work for both The Review, our quarterly print journal, and The Report, our core online publication. 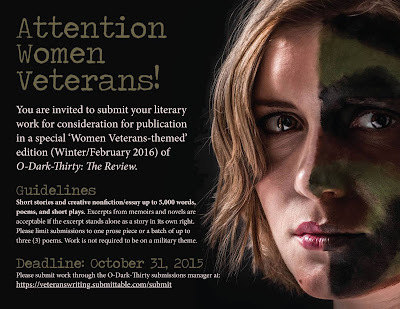 Women veterans who write—if you haven’t yet submitted work, please consider doing so! Short fiction, nonfiction, and poetry submissions are welcome, and the work doesn't need to be on a military subject. If you don’t make the deadline for the themed issue, don’t worry: we read submissions year-round and would welcome a chance to read your work at any time."